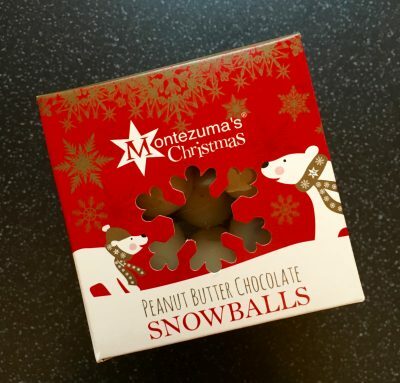 Christmas treats are here and the limited edition foods are in full swing. Following the Bonfire Toffee & the Gingerbread Ring I didn’t think Krispy Kreme would miss the opportunity to get on the festive train, and thankfully they have climbed aboard with plenty of time before the big day itself. 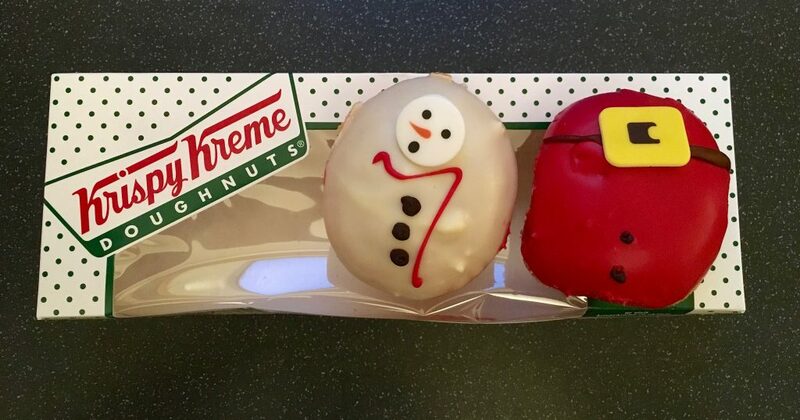 To see us through to Christmas we have Krispy Kreme Santa Belly and Melting Snowman and Snowflake Sprinkles. Now there was quite the debacle in getting said doughnuts. These did in fact come out yesterday and as usually happens on a Monday, the day does not go to plan. Nonetheless come 4pm I scurried on down to Krispy Kreme to find that shock horror they had run out of pretty much every doughnut. This has never happened before and I was most disappointed. Thankfully today is a new day and I have 2 of the festive trio. Why only 2 I hear you cry, well a prelude to my moans down below, the Snowflake Sprinkles is a just their chocolate iced ring with snowflakes on, aka no different to any other time of the year aside from the decoration. Kicking things off is the big man himself, the Santa Belly. Boy was this a messy one. Cutting open revealed a full to bursting chocolate kreme filling that I think it’s fair to say everyone will want to plonk their face in it. 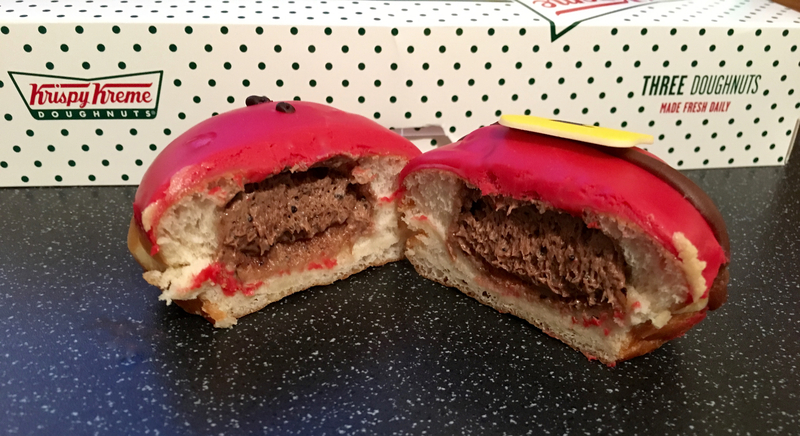 The thick soft raspberry icing was particularly fruity and as expected worked gloriously with the intense chocolate kreme. I liked that they opted for more of a whipped mousse filling giving the doughnut an even lighter feel. The dough itself was not the shining star here for the pure reason that the filling and icing took over, that is not a bad thing by any means. Nonetheless the doughnut was light and fluffy and an all round gooden. From Santa to Snowman, isn’t he cute for a snowman who is melting. 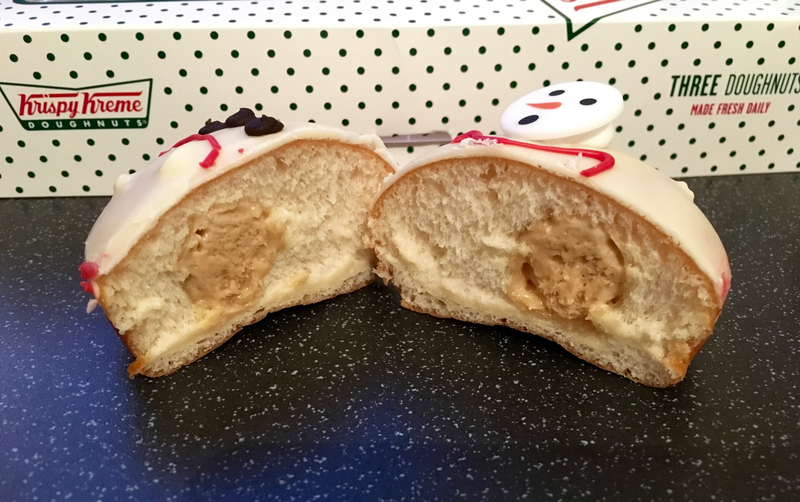 I feel Krispy Kreme could have done better here with the snowman head and possibly gone for a little marshmallow rather than hard disc. 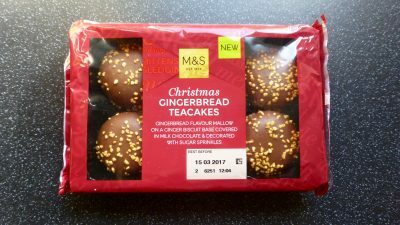 This was the kiddie I was most looking forward to, purely for the caramelised biscuit filling however cutting open revealed quite the lack lustre amount, especially when I began eating it and in comparison to Santa’s chocolate. Subsequently the flavour was barely there and in actual fact the doughnut as a whole lacked in any real delicious or indulgent taste. To be honest I didn’t even know there was a white chocolate flavour coating until reading the description, and nor did the chocolate buttons taste of chocolate, I again question why they haven’t opted for actual chocolate dollops or perhaps actual chocolate buttons. It’s a 50/50 here. Despite thinking I wouldn’t enjoy the Santa Belly, I actually loved it and would happily devour another. The Melting Snowman on the other hand was a complete let-down and not one I would recommend. My real bugbear however is that despite their fabulous festive decoration they aren’t actually festive flavours. Would it be too taxing for someone at Krispy Kreme to come up with some christmas flavours? Two of the easiest would have been chocolate mint or chocolate orange and Santa’s Belly is half way there with the chocolate kreme, so the orange or the mint wouldn’t be to much of a stretch. I cannot help but feel that Krispy Kreme know that people will buy their doughnuts and thus really don’t fulfil the potential of some epic doughnuts that really standout from the rest and instead it is a can’t be bothered attitude. I’d love to hear what your thoughts are on the Krispy Kreme Christmas doughnuts, or indeed any of their doughnuts? See you all tomorrow for another Christmassy review.